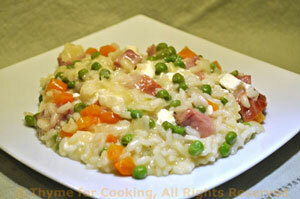 Easy Dinner from Thyme for Cooking: Risotto with Feta, Ham, Peas and Carrots. This is a colorful risotto with bright green peas and orange carrots. 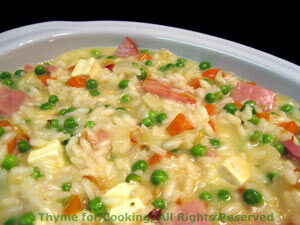 The peas give a lovely bright color to this risotto. The feta is the Greek-type: small cubes that come in glass jars, covered in oil. Any feta will work. It doesn't melt like other cheese, adding a twist to the dish. In medium saucepan heat butter; add 1/2 of the onion and sauté until transparent then add rice and sauté, stirring, for 2 - 3 minutes until rice has white center. When stock is almost absorbed add another 1/3 cup and continue adding 1/3 cup at a time and stirring. Before you add the last 1/3 cup taste a few kernels of rice. They should be just 'al dente' - slightly resistant to the tooth but fully cooked. If more stock is needed add it 1 tbs at a time and waiting until almost completely absorbed. At this point risotto will be thick but not stiff - there will still be visible liquid and it will not hold it's shape on a plate. Add the Parmesan and the condimenti, including the feta, stir well, pour into a bowl or risotto platter and serve immediately. It will continue to absorb liquid and the leftovers (if any) will be quite stiff. The risottos that we have eaten in northern Italy have all been served in soup plates (flattish bowls) and eaten with a spoon - not a fork. Peel carrot and cut into 'pea' size pieces. Add onion, carrot and sauté until tender, 6 - 8 minutes. Add ham and sauté 5 minutes longer. Add peas and 1/4 cup of the chicken stock for the risotto. Cover, reduce heat and simmer until peas are thawed and carrots cooked through. Turn heat to low and keep warm until needed.